Yesterday's rain-soaked Daytona 500 has been rescheduled again to 7:00 pm tonight because of rain. The delay has been an inconvenience for NASCAR enthusiasts, but a boon to fans of rain-friendly motorsports. Forecasters seem to think that'll give the track enough time to dry in order for a race to start and will, conveniently, push the race to primetime on Fox. Sorry all 14 House fans, you'll have to wait a while to discover if Chase and the mousey brunette finally hook up. 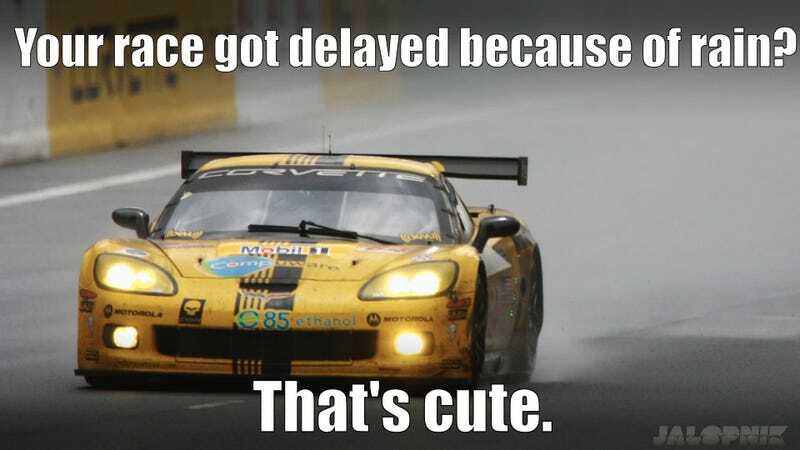 In the meantime, head over to our office Facebook page to post your favorite version of the "Rain Delay Meme" and have a little more fun at the expense of soggy NASCAR fans.